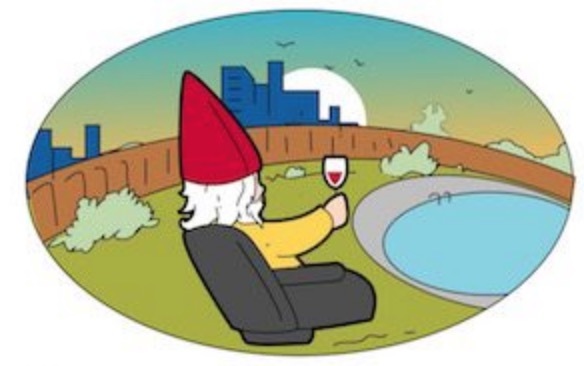 As avid party hosts, we here at The Backyard Gnome are always looking for new and exciting ways to pump up the jams. 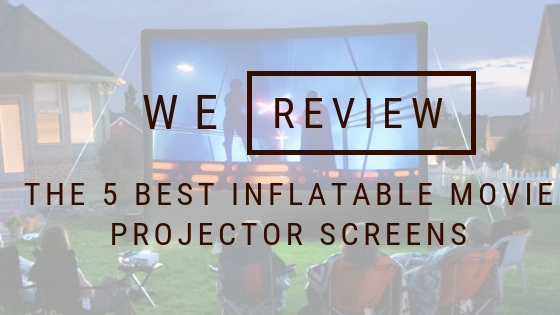 And this time, we’re taking it quite literally, by reviewing some of the best outdoor inflatable movie projector screens of 2018, including models by Holiday Styling, Gemmy, Loch, and more! We’ve researched screens that are good for movies, presentations, video games, which are relatively cost effective to boot, and you will find these models later in this article as we break down the pros and cons. 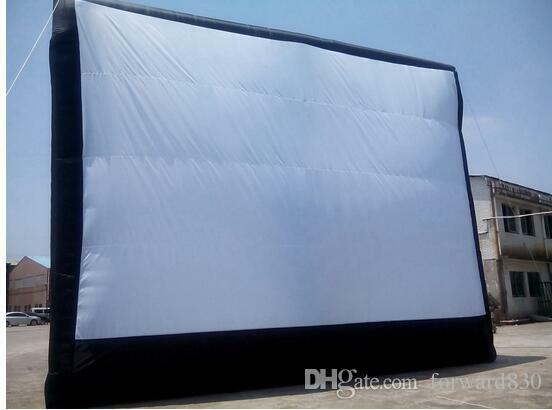 Why Get An Outdoor Inflatable Projection Screen? 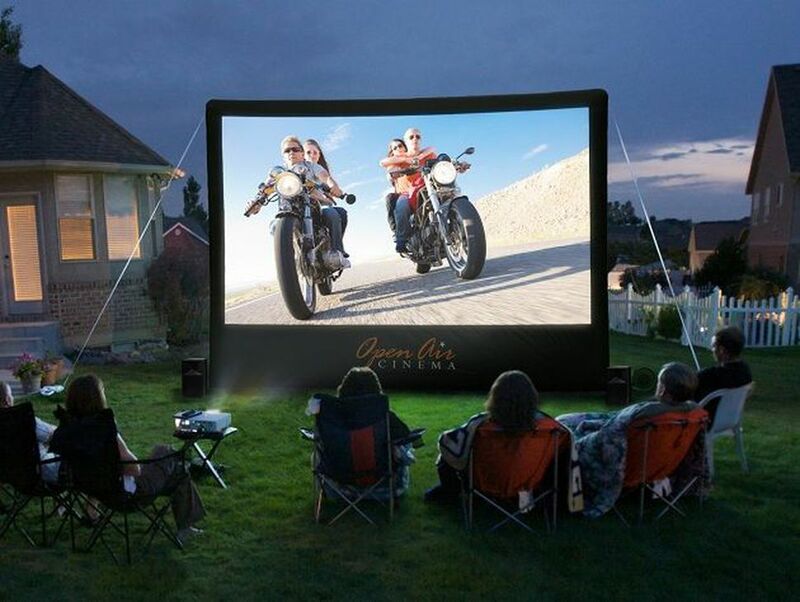 Now, before the invention of these amazing outdoor inflatable screens, people who wanted to play movies or watch the big game outside, had to invest in super expensive outdoor home entertainment systems that were mainly electronics-based. Fortunately, progress, cost efficiency, and uber practicality has brought us to the point where for less than $200, we can purchase an inflatable movie screen and have the same “big” experience without forking over a huge amount of cash. Whether you’re the head of a neighbourhood association needing some new summer activity ideas, or a mom or dad planning a birthday party with some yard space to spare, you’ll want to be taking notes as we dive deep into this topic. Day or night, these screens really get people excited! In fact, once you blow one of these puppies up to full size (ranging from 6′ x 7′ on up to 30’+) and get a movie going, your party is going to become larger than life, and go down as legendary with family, friends, neighbours, and anyone else in attendance. And the beauty is, you can have these parties on the regular if you have the nacho budget for it. People don’t soon forget those who once set up the giant screen in their yard and beckoned all to come forth! Heck, we’ve even seen pizza guys grab a lawn chair and skip the rest of their shift because they have somehow never seen “Gremlins”. 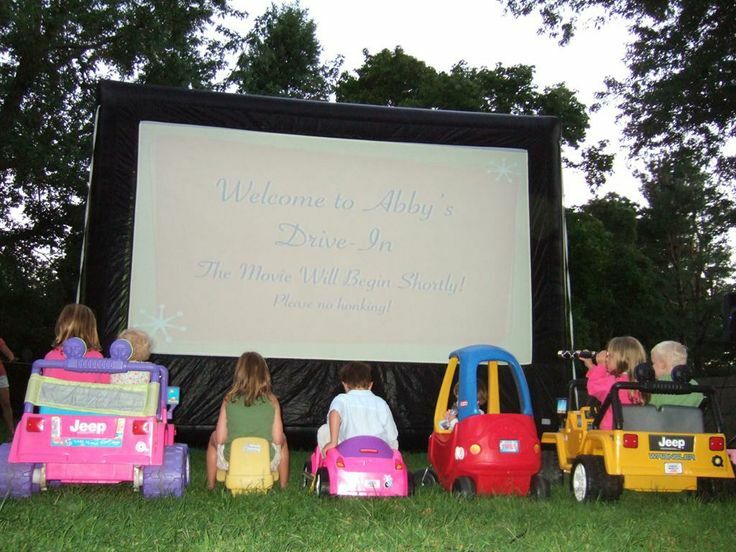 These screens are great for all ages as well – everyone loves a good movie night! 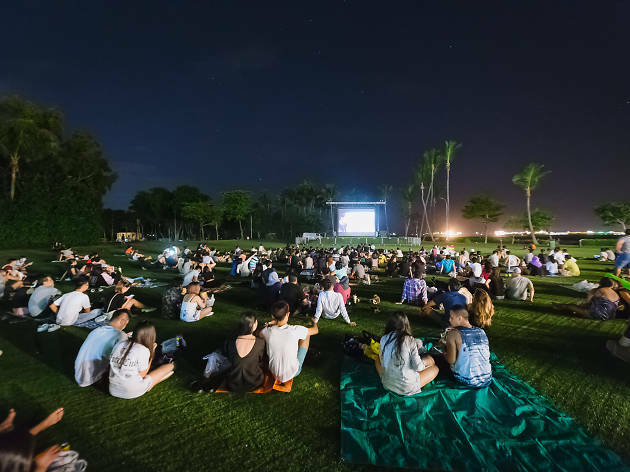 It’s Outdoor Inflatable Movie Screens 101 & You Need To Pass! 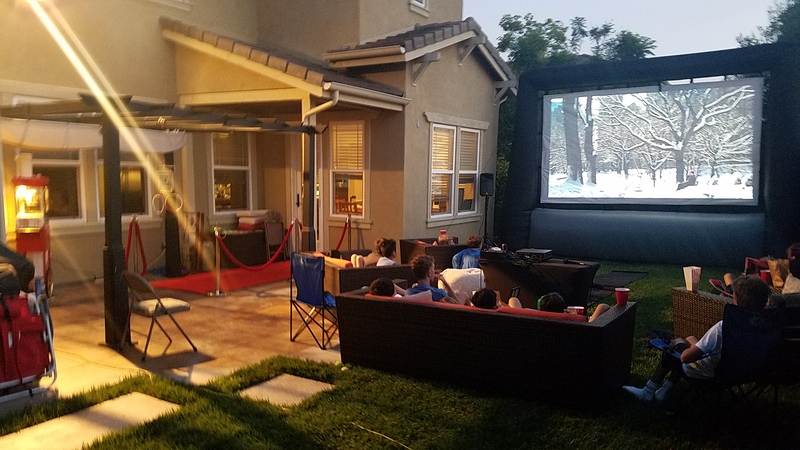 As great as all of this sounds, there are things you should know before you purchase your first (or your next) outdoor inflatable movie screen. In other words, there are things you’ll want to look for, and there are things you’ll want to avoid. We’re talking about the set-up (inflating the screen, staking it to the ground), the weather (wind, rain), the maintenance (cleaning, storage), avoiding wrinkles, and more. This is why we’ve put together the following handy crash course guide, along with reviews of some of our top picks for what we consider the best inflatable movie screens on the market today. Inflatable Movie Screen Blowers – Are They Quiet or Loud? You’ll want to pick a screen that fits comfortably on your property, obviously. It should be one that allows everyone to see the movie or show being projected. 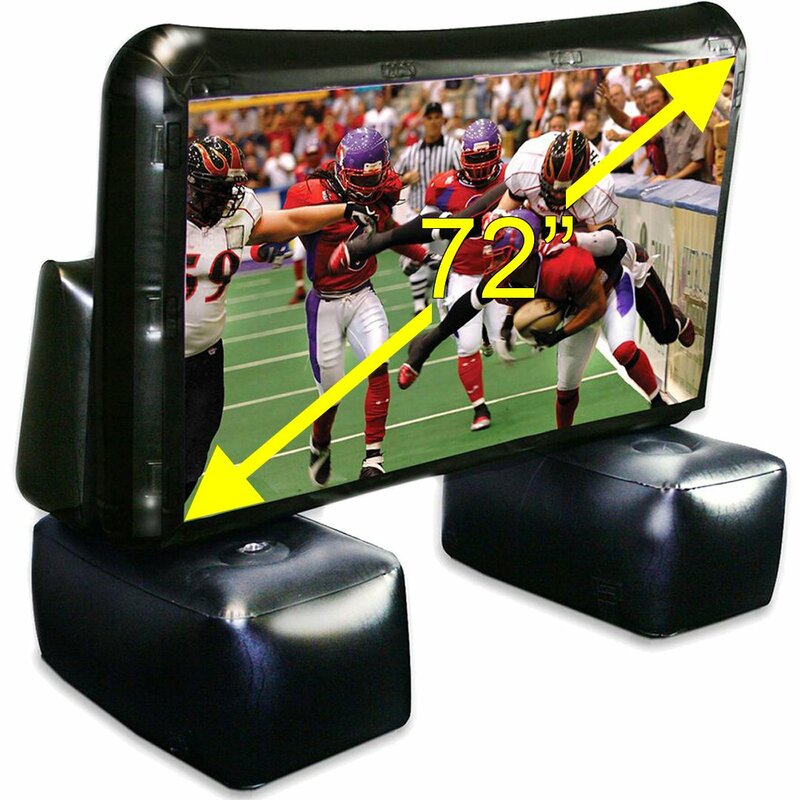 Most companies that sell inflatable movie screens will give you a selection of sizes, and this is extremely helpful, assuming you are a person who knows how big your space is where the screen will be inflated. These screens always come rolled up and sometimes stuffed in a tote bag, so their size can be deceiving, especially if you are spatially challenged. Here are some common screen sizes and how many audience members they can accommodate, approximately. Remember that there’s often a diagonal measurement taken by the company, and that does throw some folks off, since it is longer than the horizontal width. The size of the screen is a consideration that is easily met, simply by you measuring your space with a tape measure if you are unable to eyeball it. You at least want the screen to be able to fit comfortably in your yard. And don’t be fooled into thinking that bigger is better. If you have a smaller yard, get a smaller screen AKA a screen that is appropriately sized to your yard. Have you seen National Lampoon’s Christmas Vacation where Clark W. Griswald brings home the Christmas tree that’s far too big for his living room, and it ends up smashing through the windows due to being so frickin’ huge? Well, just picture buying the screen below, and it looks like this. Then think how this will look when it expands to 10-20 x the size of the bag you got it in. So, you open it up, and it starts to give you an idea how much room this sucker will need. You’re getting what we’re putting down? You don’t want to inflate your screen once you get it and it leaves no space for anyone to sit and watch the movie. There should be enough space to adjust the screen and walk around it, for safety reasons and also just so you can get around the thing. A screen that is too big in a small space will also be hard for people to see. The audience will be craning their neck to see all the action. You need something that fits just right. 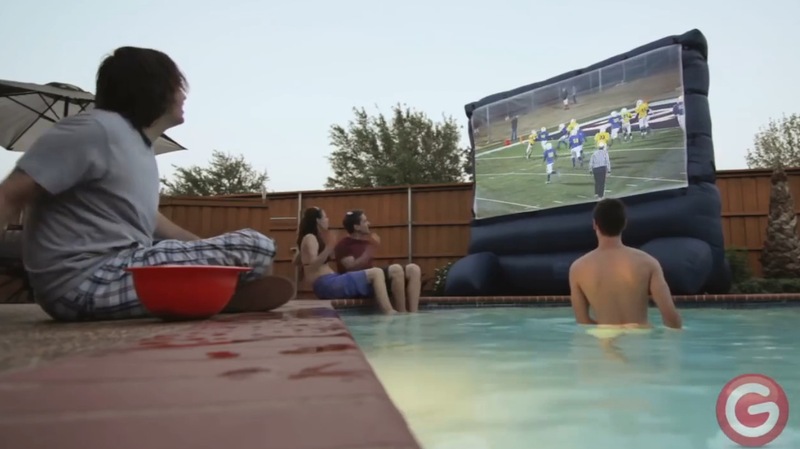 Bottom line: Keep the size of your yard and the size of your new inflatable screen in mind. Don’t make the rookie mistake of buying the wrong sized screen. If you are wondering if there’s a possibility that you don’t have to use a separate air pump, or use your old bicycle tube pump to pump up these screens, which would take about an hour and most of your soul to do it, you are in luck! Many of these screens you simply plug in and they inflate themselves in minutes. Huzzah! Self-inflating screens are by no means rare, but not every model is like this, so if this is something you’d prefer to have, make sure it is a feature of the screen you’ll be purchasing. If you read the fine print, some screens take 2 minutes to fill. Others can take 54 seconds flat. If you’re someone who thinks time is precious, and can’t waste a second, these kinds of things probably do matter to you. 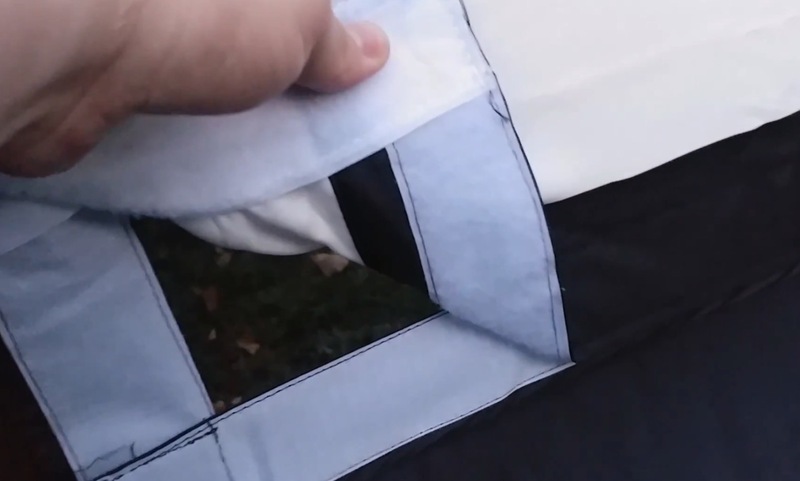 If you’ve spent any time manually inflating objects for the past century, or had to blow up an air mattress using only the breath in your lungs, you’ll realize what a miracle a self-inflating screen can be. Then again, if your inflatable screen is one of the larger ones (ie. 36 footer as below), the several minutes it takes to inflate can be about as exciting as watching paint dry. Other smaller ones that are roughly 10 feet wide can inflate in about 30 seconds, no problem. If you want to get an idea how exciting it is, here’s a video that shows the inflation in progress with a couple of larger screens. On their own, these giant screens are simply big bags of hot air in the shape of drive-in theatre screens, so that can be a problem if the weather turns on you. I’m sure you know those days that Uncle Bert might consider to be “iffy” as he looks suspiciously at some cloud cover rolling in, where there’s some wind here and there, but not enough to cancel the party. You’ve planned this party for weeks, and your intention is to go through with it, dagnabbit! So what if there’s a hurricane making landfall in a neighbouring state in less than two hours? 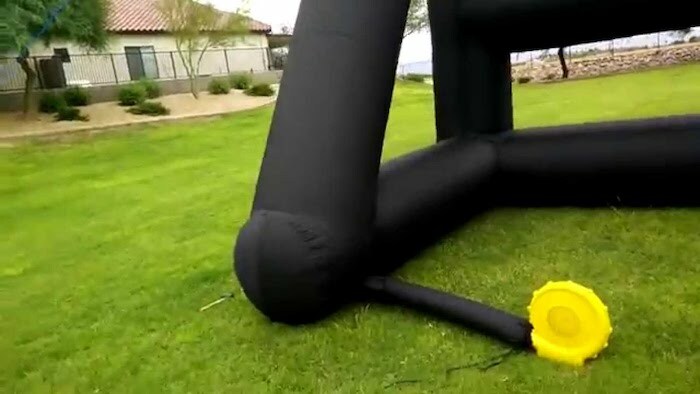 And so, having the proper equipment to tether your inflatable screen to the ground is very, very important, as I’m sure you can imagine. 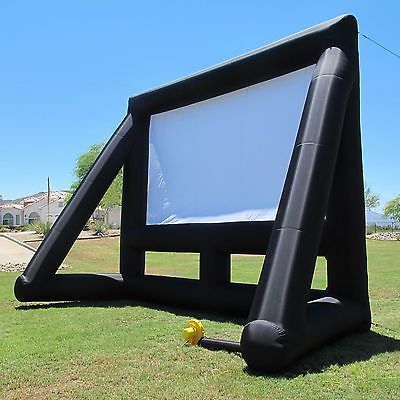 In fact, if you were to buy one of these inflatable movie screens, it would, generally speaking, be expected to get the proper gear to tether it down properly. It does depend on the shape, though. Some screens come in shapes that offer their own supports, in the form of legs and things of that nature. Other screens absolutely positively need ropes and anchors in order to keep them tethered to the ground. Remember that this is the same equipment you’ll see with a tent – stakes, ropes, etc. See the model below for a screen that has been tethered to the ground. As you can see, the ropes are taut and pulled away from the screen. This is the best bet for keeping a screen like this one grounded, even as the winds pick up. Bottom line: make sure your movie screen comes with the proper supports to keep it grounded. Most of them do, but certainly be aware of the ones that don’t, or claim not to need any supports. Of course, just having the supports are one thing, but figuring out how to use them strategically so they’re most effective is a whole other thing. In any case, give yourself some time to set up your inflatable projection screen properly, lest it decide to take off mid-screening! 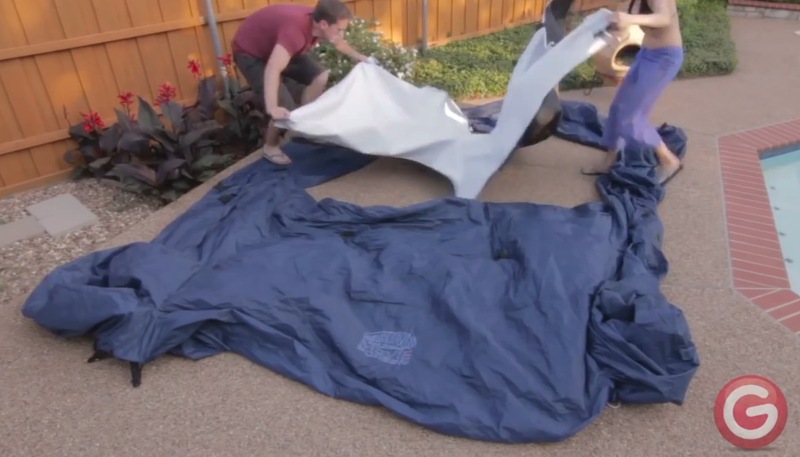 When you get your inflatable movie screen set up, you’re likely going to be dealing with a blower, since most of the time, blowers are what keep the screen inflated. The setup of the blower is always going to be a little different, in terms of where you plug this bad boy in, but usually you’re going to be provided with instructions on how to do this. Considering you’re spending $150+ for the entire package, it’s the least they can do, really. Once you have it all hooked up and it’s good to go, you will notice that the blower does make some noise. Ideally, this sound isn’t going to be any louder than your average small vacuum, and the fact that the blower is attached to the screen itself to constantly fill it, is going to make it a little quieter. Still, people have complained about the blower being too loud, or they didn’t even expect the blower to be part of the equation at all, and so it can be slightly surprising for some to have to hear it while the movie is playing. However, back away a few feet and the blower should not be noticeable over the volume of the movie. Well, provided you have some speakers that can give you a decent volume for the sound. If you’re using errr.. your laptop speakers to play a movie for dozens of people, that’s not going to work regardless of whether a blower is attached or not. After you inflate your movie screen, you might notice some lines or wrinkles in the fabric of the screen itself. Depending on how wrinkly it is, this can be perfectly normal. One thing to consider here is that once you project a movie onto the screen, the wrinkles probably aren’t going to be noticeable. Some of these screens are so big that once they inflate, there’s bound to be creases here and there. These screens aren’t meant to blow up to an extent where they’re ready to burst. They inflate to the size they need to be at in order for you to project the movie onto it. So, be a little forgiving of these wrinkles. Chances are they are totally normal for the screen you bought. However, if you are convinced that the screen is just too wrinkly, and it’s noticeable even when the screen is fully inflated and you’re watching a movie, then maybe you have a problem. In this case, you may have a leak or you may have a faulty blower. This is worth looking into, if you find this to be a persistent problem. You also need to consider that maybe the screen itself is not inflatable, and attaches via velcro, which some of them do. In that case, maybe you just didn’t attach the velcro in the right spot. With some screens, you get not just front, but also rear projection. In other words, you can choose to project on the back of the screen, if you want, or the front. 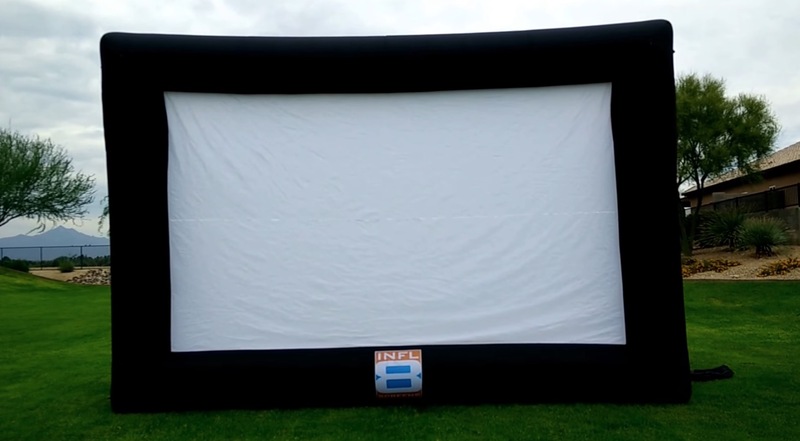 Most inflatable movie screens that are within a reasonable budget do not offer this dual-sided nature, but some do, and those are worth looking out for, if you prefer to not have the projector around the front. Because the material needs to be of a certain kind to offer this feature, the price of the screen is going to go up, since, generally speaking, lumens are lost when projecting from the back, in order to be seen in the front. With the right material, however, this isn’t a problem. Once again, this might be worth a call to whoever you’re buying the screen from, to ensure you’re getting exactly what you want. 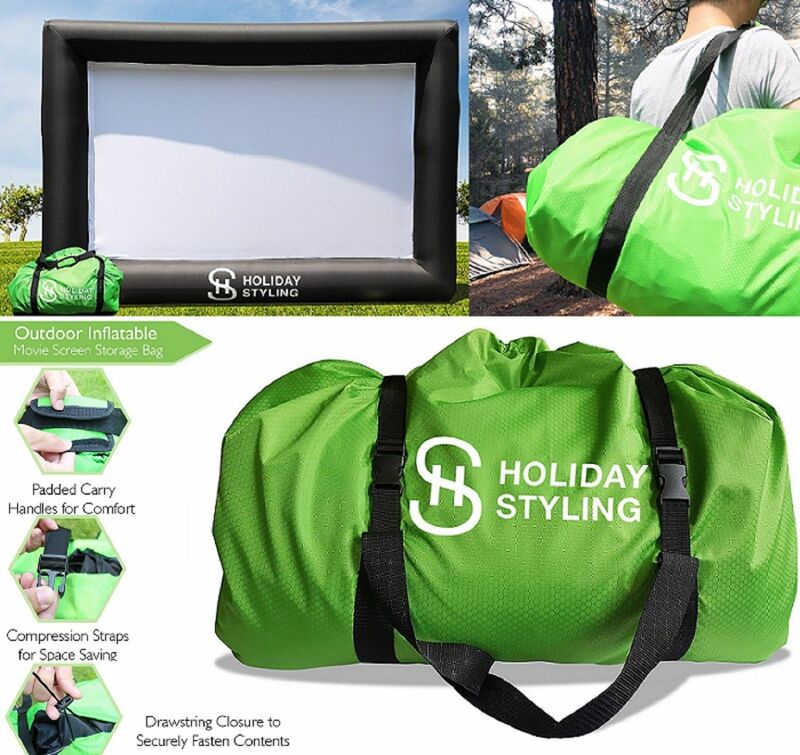 Many of these inflatable movie screens come stored inside a storage bag, like this Holiday Styling model here. It’s amazing that you can fit such large screens into these bags, but hey, it clearly works! These bags of course mean that your screens are going to be super portable, and easy to take with you just about anywhere you feel like watching movies on a giant inflatable screen. So, you’re not limited to your backyard, nosiree! A quality bag will be made from quality material, and have a nice shoulder strap and close up nicely. You know a company is good if they give you an actual quality tote bag to go along with your movie screen. Many companies drop the ball on these extras, thinking it’s enough to give you the extra, but forgetting to actually make it a quality product. Trust us, it’s almost better to have no tote bag at all than to have some falling-apart flimsy piece of crap. Reputable companies will not make this mistake, as they use the products themselves. Inflatable Screen Comes With Projector? Of course, what good is a giant inflatable movie screen without the projector itself? You’re going to be needing a projector, but what kind you get is up to you. Projectors are their own thing, and they generally don’t come with these types of movie screens. Considering that the screen itself is probably going to run you over $150, as you can imagine, companies aren’t going to be throwing in a totally free projector. This is not an extra, by any means. You wouldn’t want the projector you get if it were an extra, either. So, you’re going to need to shop for a projector, and, when you talk to the clerk at the store, you may want to mention what purpose you are buying a projector for. That way they can give you some context when buying a projector that will be sitting on a table outside. Buying a projector isn’t necessarily expensive, but it is an expense, and is usually sold separately from the screen. Sometimes, you can get the whole thing in a package deal, but it does bump the price up substantially if you want to get it all in one shot, and then get it delivered. Keeping the screen clean is another thing to consider before you purchase. Make sure you’re going to be able to care for the screen by having some kind of cleaner that is friendly with vinyl plastics handy. Keep your screen clean and you’ll be able to use it for its express purpose – watching movies, playing video games, watching Youtube, from the comfort of your lawn chair. No smudges to muddy the picture. The screen material is usually a textured vinyl, but it can also be closer to fabric and not the same as the material around it. Often times, the screen can be velcro’ed on, and so that means you can remove it and clean the velcro and the screen too. 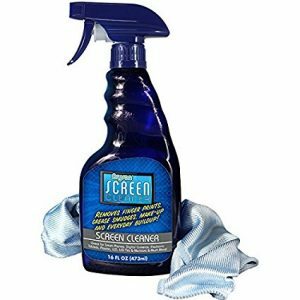 You don’t have to purchase actual screen cleaner like you would for electronic screens. 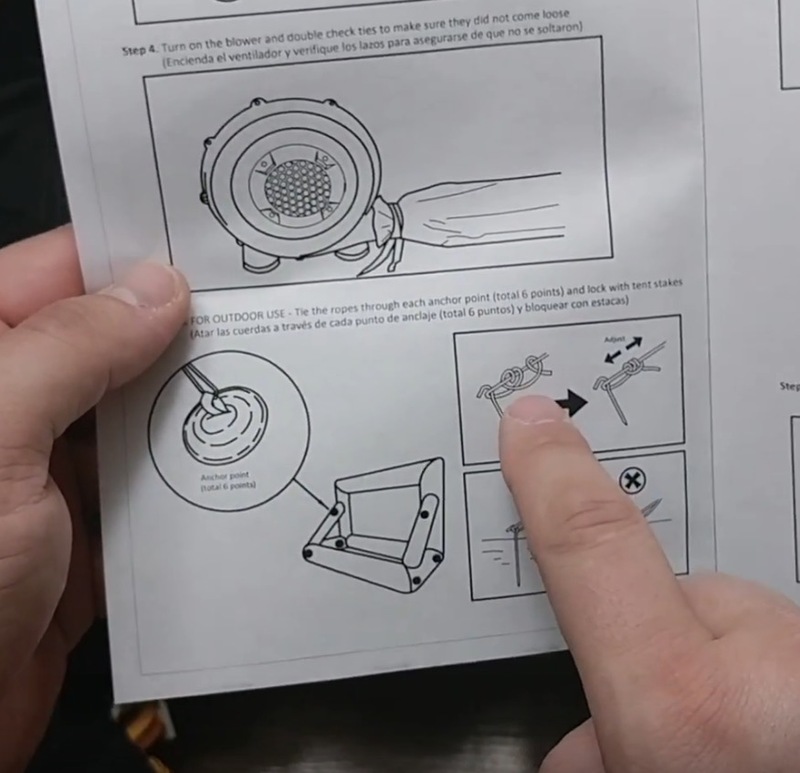 Though, you might need something like that for the projector itself, if you want to buff that up as well. But the main thing is the screen, which is, to be fair, going to be exposed to the elements, and perhaps kids throwing ketchup – who knows? A healthy washing with soap and water could be all you need to keep the material good as new and the picture quality crisp. Or, if it’s machine washable, just toss it in the washer and bingo bango. The aspect ratio of the film versus the aspect ratio of the screen can be at odds. It’s generally helpful to understand screen proportions to ensure you’re getting a screen that will fit the movies you want to watch. They usually run 16:9 or 4:3. Aspect ratio probably won’t be a big deal to most people. Regular movies do play fine on these screens, but if you’re some kind of film buff that watches only French films from 1936-1938, you may wish to study the aspect ratio of the particular screen you’re thinking of purchasing more closely. 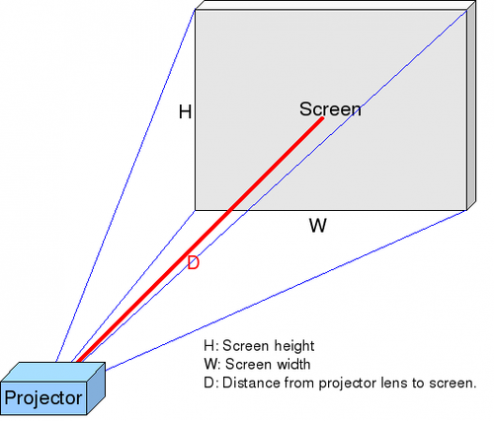 When there is more space between the projector and the screen, the picture is larger. Make sure you have enough space between your projector and the screen to fit the picture on the surface. Also, you may need to elevate your projector, move it back, move it forward, tilt it, etc etc. Just be prepared to shimmy things around a bit until you find the perfect spot for the projector to be. Now that you have some more information about how to pick a screen, it’s time to look at the ones we’re recommending. We have compiled a list of the top five inflatable movie screens for you to contrast and compare. Each one on this list is designed for outdoor use, due to the vast amount of space they require, but some can be used indoors as well, space permitting. They are listed in no particular order: they’re all winners in our book! 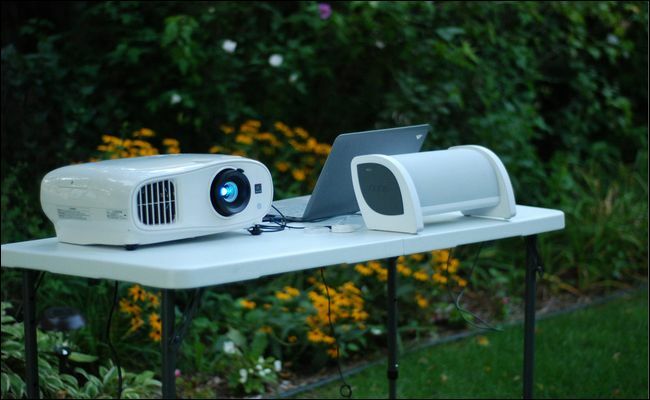 So grab a projector, DVD player or laptop, a pair of speakers, and one of these screens, and you’ve got your own personal backyard movie theatre. The Gemmy movie screen has you covered. It measures at a gigantic 123×77 inches and comes with a durable bag for storage, as well as stakes and tethers for keeping it in place while you enjoy your favourite films. It comes with two fans that sit at the base of the screen and keep it inflated. Don’t worry about fan noise: it is barely noticeable, and certainly inaudible while the movie is playing. While this is durable material, it’s incredibly lightweight. The entire shipped package weighs less than 30 pounds. That means collapsing and storing the screen should be simple and easy to manage for anyone in the family. This one sells at a great price point of around $250. 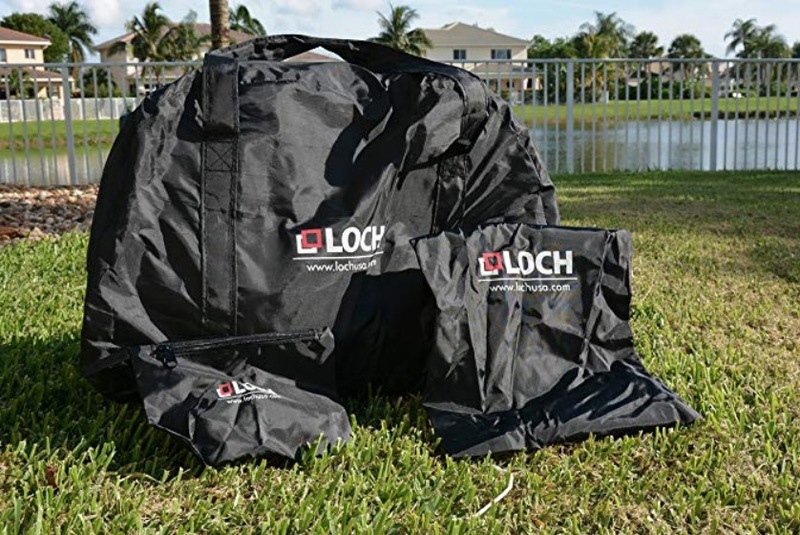 The Loch USA inflatable projection screen measures in at 200” and is nothing short of amazing. If you really want to make the neighbours curious with envy, this is the statement piece of the year. You can easily entertain groups of 100+ with a screen this size. You can set it up at the park, in your yard, or even at a recreation centre (if possible). It’s viewable from the front and the back. You don’t have to worry about installing it incorrectly. With this feature, you’ll be able to show two movies at the same time, too. This is another great feature for groups of people. If you wanted to use this for your events or for local charity functions, it’s the perfect size. 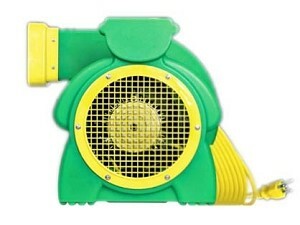 It comes with professional blowers that inflate that screen, tethers, stakes, and a storage bag. However, some people have difficulty fitting it back into the provided bag and prefer to roll it into a plastic storage container, instead. With its black frame, it looks like a giant real television. Aesthetically this is one of the prettiest. It sells for around $430. The self-inflating projection screen by Holiday Styling is a massive fourteen-foot-wide, made of triple grade 600DD material. This screen has the advantage of accepting both front and rear projection images, making it a great choice for a DJ or any large party that requires the hiding of some equipment. This movie screen is very lightweight. This makes it simple to set up as well as break down for storage. If you wanted to travel for events with this screen, it won’t break your back. The screen weighs less than 20 pounds. As long as it is packed tightly, it’s easy to transport. 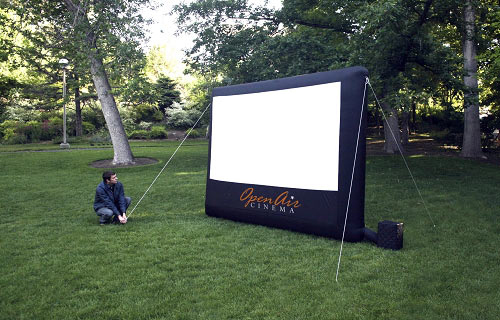 Its enormous size makes it perfect for outdoor screenings for large groups of people that would otherwise overpower your house! It is very lightweight and easy to set up. It’ll prove to be as much of a spectacle as the movies you watch on it. Another massive beauty! The Gemmy 12 foot screen can easily entertain large groups of one hundred people. 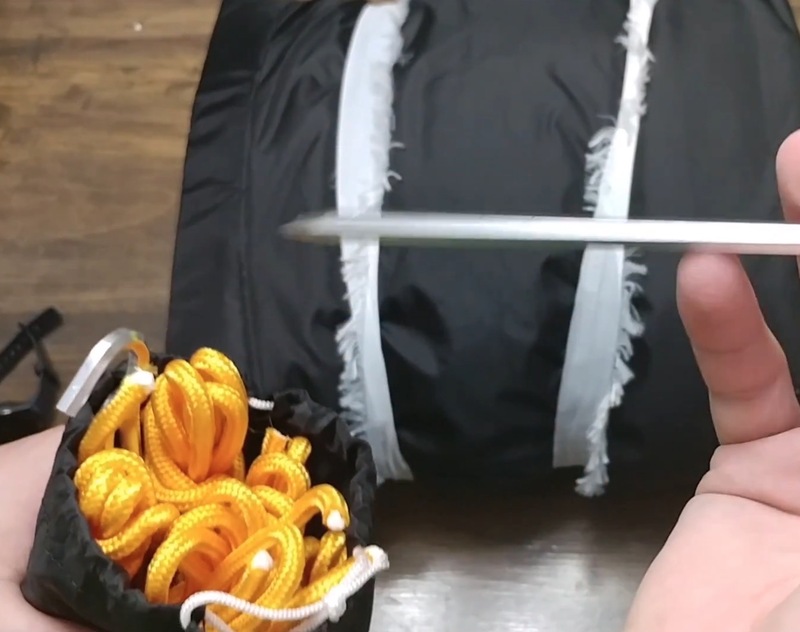 It comes with two fans that sit at the bottom on either side of the screen to inflate it in seconds, and keep it inflated. It sets up in about 20 minutes and deflates in 20-25. The fans are very quiet and you don’t hear them once the movie is playing. It also comes with stakes and tethers, which are very important to use, as this screen will go tumbling if you don’t secure it! The only downside we can see to this one is the colour: it is not black like the others on the list, but a dark blue. However, since projection screens work best in the dark, you won’t notice the colour during the movie. It is the best price point on our list, selling for around $150. Perfect for town reunions or birthday parties. This one is for the kids, or any avid Disney fans! It is all dressed up like Mickey Mouse, with a red base (including white buttons), black frame, and mouse ears on top. 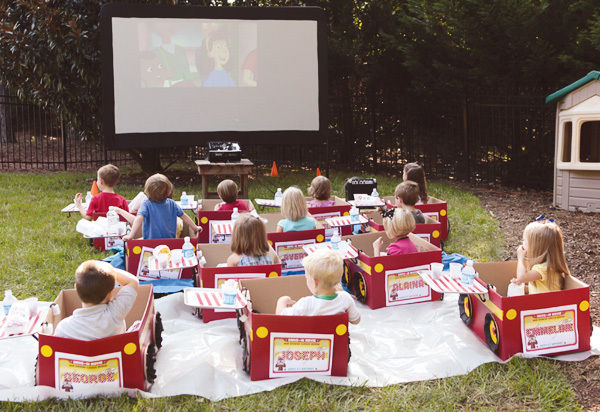 It is a real hit for kids’ birthday parties or family movie nights, especially when set up in the backyard with a Disney movie and some popcorn. The fans are quiet and not bothersome while watching the movie. It comes with a red Disney bag for storage. Setup and take down are very simple. The screen clips on, making it easy to store carefully (we recommend rolling the screen to prevent wrinkles). It is very lightweight, making it easy to carry around and set up. Let’s face it: this screen is super cute and good for kids, but keep in mind that projection screens work best at night when using outdoors, or in the dark if using indoors. Be sure to consider this if buying for a daycare type setup. Sells for around $300. 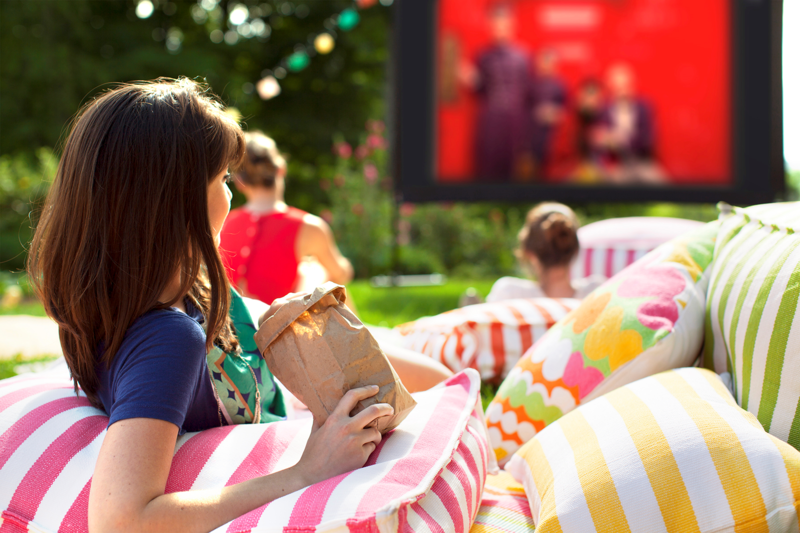 There you have it: our top five inflatable movie screens. They all come with tethers and stakes to keep them in place. It’s important to use these pieces, due to the inflatable and lightweight nature of the screens. Make sure kids and pets can’t trip over the tethers in the dark. In addition, they all come with professional fans that inflate the screen for you (thank heaven for all things self-inflating), making them very easy to set up and take down, regardless of their sublime size.